Hmm….my fish aren’t looking as lively today. Aquariums are delicately balanced tiny ecosystems, where if even the smallest thing is off, the situation can quickly go from ‘minor problem’ to ‘fish apocalypse’. Because of this, it’s important to act on problems early, when they can still be remedied without losing all your favorite fish. Sometimes the symptoms of a problem in an aquarium can be easy to overlook, but other times they’re so blatant they may as well hit you over the head. The key is to keep a close eye on your fish tank and recognize when something is wrong. It’s no shocker that a dead fish in an aquarium is a major sign that something is amiss. But too often, people simply scoop the fish out and carry on as usual – without investigating why the fish died. A dead fish means you should drop whatever you’re doing and check out everything in the aquarium. And when I say everything, I mean everything. Test the water, test the pH , check the filter, check the food, and scour the aquarium for any signs of disease. If you need a test kit, The API Freshwater Test Kit is an excellent choice for testing pH and water quality. Even if everything appears to be fine, it’s important to keep watch over the aquarium for the next few days for any sign of disease or fish acting strangely. 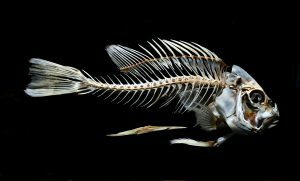 Sometimes fish just die – especially if they were only recently added or elderly. But most of the time it’s a sign of trouble in an aquarium. White or grayish water in an aquarium usually isn’t a cause for alarm, but sometimes it can indicate a problem that needs to be dealt with. There are three main causes of cloudy water: improperly washed gravel, dissolved constituents, and a bacterial bloom. If gravel isn’t properly rinsed before being added to an aquarium, it may cause cloudy water. But it’s nothing to worry about and it will normally sort itself out after a few water changes. However, if the problem is severe enough, then the aquarium can be drained and the gravel rewashed. If the cloudy water is the result of dissolved constituents, it usually means there is something off with the tap water. It could be that there are high levels of phosphates in the water, or a high pH, or even heavy metals in the tap water. Luckily, in most cases, this can be solved by using water conditioner before adding water the aquarium. But out of the three possible causes, it’s the last one, bacterial bloom, that can be a cause for concern. Often, bacterial blooms are completely harmless, and they are the result of overfeeding or decaying plant matter (dead plants or leaf litter). But sometimes, it’s a sign that the beneficial bacteria levels are off, and ammonia, nitrites, and nitrates should be tested immediately. If there is a spike in any of those chemicals, then immediate water changes should be performed, and if the problem is truly severe, then either fast growing live plants should be added to reduce the chemicals, or store-bought treatment products should be used. Fish gasping at the surface of an aquarium signal a major problem. The water at the surface holds the highest level of dissolved oxygen in an aquarium, and fish gasping at the surface of a fish tank are desperately trying to get enough oxygen. There are several possible causes: high temperature, poor water quality, and disease. The first thing that should always be checked in an aquarium with fish gasping at the surface is the temperature. Warm water holds less oxygen than cool water. Make sure the heater is functioning properly and that the temperature is within the preferred range. If the temperature is within the ideal range, then the fish gasping at the surface of the aquarium may be caused by poor water quality. First, test the water to ensure ammonia and nitrites are both at zero. If there is any trace of either ammonia or nitrites, do an immediate water change, and continue with daily water changes until ammonia and nitrites are at zero. Should those chemicals both register at zero, then the fish are likely suffering from disease. Check for signs of infection, which includes fungus, bloat, clamped fins, or ich. It can be difficult to diagnose some fish diseases, so use experts available at fish stores and online resources to help. If you don’t see any obvious signs of infection, the problem may stem from aquatic plants. Lack of oxygen is often seen in heavily planted tanks. Plants at night often deplete the oxygen in an aquarium, and if you find thee fish are only gasping at the surface of the fish tank in the morning, then it’s probably due to the plants. Another potential problem in planted tanks is that it’s possible to add too much CO2, which could also be the cause of the low oxygen levels. Any significant change in your fish’s behavior often signifies a problem. Fish show problems in many diverse ways. Sometimes the fish will refuse to eat, other times they will have difficulty swimming, or alternatively, they will frantically swim around an aquarium. Sometimes their colours will fade, or the fish will bloat, until their scales resemble a pinecone. Or the fish may become lethargic and lie at the bottom of the aquarium. But regardless of the symptom, if a fish displays any of these behaviors, there is something wrong with your aquarium. It’s important to remain calm and discover the source of the problem. The following should be done: check the temperature, test the water, check the food, inspect the fish for signs of illness, and finally, check to make sure the filter and heater are working properly. Once you discover the source of the problem, then you can move on to treating it. Green water, fuzz on the substrate, and tiny worms appearing are all common problems in aquariums, and they point to overfeeding. They are all caused by buildup of organic waste, and while they aren’t an immediate threat to fish, they suggest there is a problem with the water quality – something that can become dangerous over time. Once again, the first thing that should be done is to check the water quality. If there are no problems with the water, then it’s usually as simple as reducing the amount of food given to the fish. 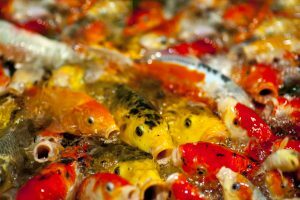 If you’re unsure of how much to feed your fish, read How Much and Water to Feed Aquarium Fish. There are few aquarium problems that can’t be remedied, but in most cases, the key to successful treatment is to catch them early. Always keep a close eye on your fish and invertebrates, and the moment you see something out of the ordinary, act on it. Good article. When I first got my tank, I kind of ignored the whole fish swimming near the top thing… ended up with a couple floaters. :/ Site looks really good. Fishkeeping is definitely an unforgiving hobby when you first start out. I think everyone has endured at least one disaster. And I’m glad you’re enjoying the site. I have a 65 gallon tank, a while back I had 2 Oscars, 1 Albino and 1 red. They were doing great! They were approximately 5-6”. On new years I came down to check on them and my albino was fins up:(. Never noticed any sickness, and were really active. In March, I lost my red, :(. I was feeding them small goldfish, not just 1or 2 at a time, just dumping in 12 or so. They were usally gone in a week. When I lost red, I desided to start over. Completly cleaned out tank, no chemicals, all fresh water, let it go through a cycle for about 2weeks. Filter and all, started off with buying Black Convicts, they bread in 2 weeks, they ate their babies, i went out and bought some other fish to go with these guys, Mistake! The convicts were brutal, I pulled the male and gave to a friend. The other fish that I bought were Green Texas Ciclids, and 2 fire mouths. There are getting along well, I jave had them for about a month or so, came down the other morning, and one of the fire mouths was fins up. The other one is just hanging out in the corner, not eating. The other fish in the tank are flying around like nothing is up. Did a 20% water change the other day and water is a bit cloudy but levels are good, ph is a little low, maybe 6.5-7. I purchased ph-up and add per instructions. I dont see any specks on the fire mouth and the others look good as well. Do you have any suggestions? Temp is at 75. Help? Usually cloudy water is a sign something is wrong with the water. Are you sure the ammonia is at 0? Some testing kits aren’t very accurate. But if the ammonia level is good, cloudy water still usually means something has been disturbed in the aquarium. It can be caused by pH fluctuation, which can be extremely hard on fish. Right now, I would do small water changes daily – maybe in the 10% range – until things seem to calm down. Also, be very careful about changing the pH, as it can cause huge and deadly swings. just get some shrimp fam, they solve all ya problems. The ontinuing saga of the mosquito fish.. I have really appreciated past advise about our utilitarian mosquito fish in our horse tank. Out of a handful of fish given to us I had one male who (in retrospect) was an amazing survivor through out the summer. In October when we started getting bad weather and time to put a heating unit in the trough, I couldn’t bear to dump him out as people around here do. I brought him indoors. I bought an aquarium (2.5 gal) with a filter and clean and care for him. I had Carpel Tunnel surgery and couldn’t clean him properly for several weeks. I looked at him this morning and he has a reddish orange dot right by his gills so I’ve been researching red dot disease. Tonight, I thoroughly cleaned his aquarium which was gross (I am going to get a bigger tank). I think I need to treat the red dot disease but from my research on the internet, I’ve found contradictory information. I am not even sure if this is red dot disease or how I go about treating the problem. I would really appreciate some advise. Thank you.